Jen and I have varying opinions on how to make burgers. One of the ways we make our marriage work is by trading off methods each time we fire up the grill for burgers. When it's my turn I simply pack in the ground beef and heavily season the exterior. When it's Jen's turn she mixes the ground beef together with chopped onion, relish, ketchup, mustard powder, Worchestershire sauce, salt, and pepper. This is what our marriage counselor calls "compromise." 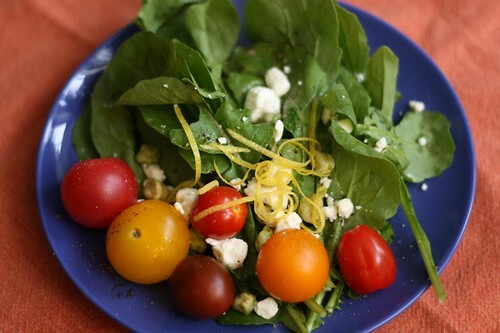 To start off I made this salad with some New Jersey arugula, mixed cherry tomatoes, olive oil, feta cheese, salt, pepper, and lemon zest. One of Jen's greatest pet peeves is a salad where the leafy greens are intact. I, however, find that it makes for too good a presentation to not do it this way much to Jen's dismay. This is what our marriage counselor calls "inflexibility." Apparently this is something I need to work on. It would be boring to always write about the same burgers. Admittedly it's boring when I write about different burgers. 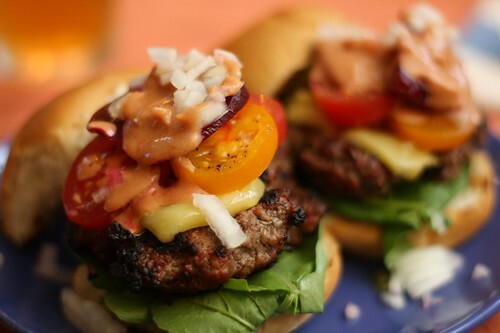 Still, I took Jen's burger mix and made my own version of the burger using arugula, sliced tomato, Irish cheddar cheese, pickled beets, chopped onion, and a sauce made with mayonnaise, kethcup, and hot sauce. This is what our marriage counselor calls "problem solving." Apparently pickled beets are a typical Australian burger accompaniment. Often this is paired with pineapple and a fried egg. Since I have not yet learned how to unhinge my jaw I opted to leave it here. This is what our marriage counselor calls "reptile deficiency." 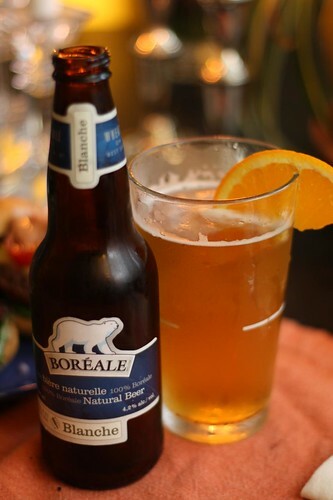 For a drink I poured Boréale Blanche, the last of the Canadian beer varieties we hadn't tried yet. Since this is is a wheat beer, Jen's favorite type of beer, I served it with an orange wedge which made more sense than when I did it the other day with the honey beer. With Canada's beers conquered it's time for me to move back to my Belgian roots soon. While I'm looking forward to doing this I have thoroughly enjoyed drinking a tiny sampling of the beers from the Great White North. The Blanche from Boréale is a very nice low alcohol beer from our French-Canadian brothers across the border. This is what our marriage counselor calls "a tasty beer."